Some people are confused about the Post Formats feature that introduced with Version 3.1, especially how it differs from Custom Post Types. Have you ever known about Tumblr? The Post Format function emulates Tumblr style posts. It all depends on what you want that particular post format to display. 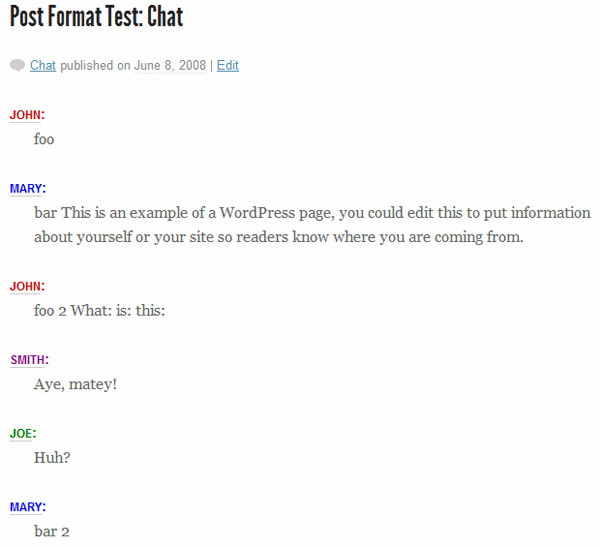 I know that when post formats first came out, the “Chat” format was always one I didn’t really know how to handle. How does the user input the chat into the content of the post? How do we display it? Write a function that filter all the chat transcript content as you want then you can styling that like standard post. What’s best solution? I don’t know! It depends on your goals which you working on. In this post, I will show you how to styling chat transcript with two solution above. The following is the CSS code that you can copying to a theme’s style.css file. As you see, I’m using <strong> to styling the name, you can change it to whatever you want. If it’s not a complete solution for you, read on. Fortunately, WordPress allow you write custom function to filter post content without edit or change the original text. It’s help you styling chat post format as you want. $chatoutput = $chatoutput . " $content = $chatoutput . " 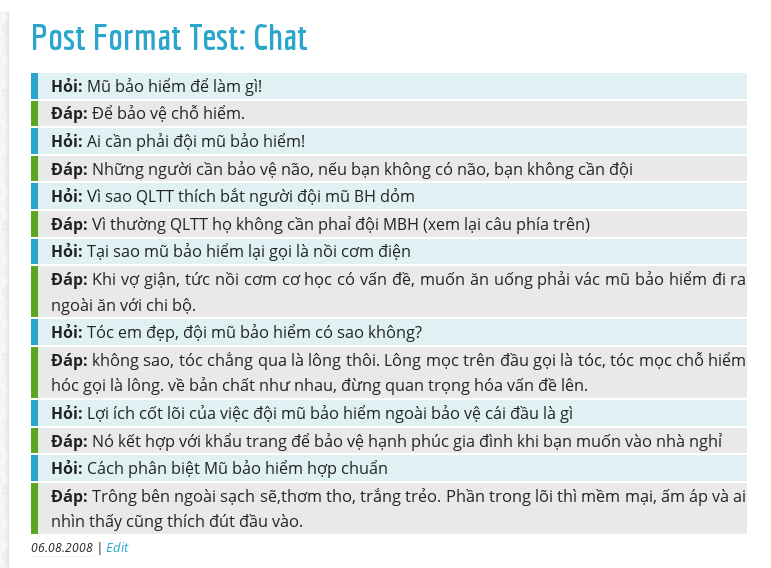 After filed chat transcript content like above, it’s look more attractive with your style. This is a fairly simple example on how to use WordPress hooks and simple condition to modify your post before it gets outputted to the browser, which provides us with some interesting ways to implement specific styled post types without hacking apart the “Custom Post Type” functions WordPress, something that is just not suited very well or meant for for these type of tasks. There’ve been no great solutions in the past, so I hope this helps in implementing something that’s useable for you in theme development. Please feel free to write your own custom functions with this code, break it, and send me fixes/enhancements you’d like to see thrown in. Interesting. I’m trying to do this with the Quote post specifically. Tips?